Prepare a large bowl of ice water and set aside. Place a large pot of water over high heat and bring to a boil. 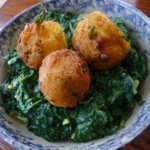 Add the large-leaf spinach, and blanch until bright green and tender, 1 to 2 minutes. Drain, immediately plunge into ice water until cooled, and drain again. Squeeze out the excess moisture, chop finely, and set aside. In a large sauté pan over medium heat, heat the olive oil until shimmering. Add the onion, and cook until soft and golden, 7 to 8 minutes. Add the garlic, ginger, and chiles, and sauté until the garlic and ginger are light brown, 2 to 3 minutes. Add the baby spinach and cook 1 minute. Add the turmeric and sauté 2 to 3 minutes. Add the blanched chopped spinach. Season with salt to taste. Cook 5 to 10 minutes, stirring often. Add the fenugreek, butter, nutmeg, and, heavy cream, if desired. Simmer 5 minutes more, stirring occasionally. If necessary, lower the heat to medium-low. Serve hot, topped with Spiced Potato Balls, if desired. For the Spiced Potato Balls: Place potatoes in a medium saucepan and add cold water to cover by an inch. Bring to a boil, lower the heat, and simmer until the potatoes are fork-tender, about 15 minutes. Drain and mash with a fork. In skillet over medium heat, combine 1 tablespoon oil, the ginger, garlic, chile, and chile flakes. Sauté until the ginger and garlic are golden brown. Add the mashed potatoes, turmeric, cornstarch, lemon juice, and cilantro, if using. Reduce the heat to low and cook for 5 minutes, stirring often. Season with salt to taste. Remove the potatoes from the heat and allow to cool to room temperature. Meanwhile, heat 3 cups of vegetable oil in a deep fryer or wok to 350°F. Make 16 round balls, about 1 1/2 inches in diameter, from the potato mixture. Working in batches if necessary, fry the balls until golden brown, about 6 to 8 minutes. Drain on paper towels and serve hot.